It's been a crazy year so far but considering what's going on in the rest of the country and rest of the world, we still have a lot to be thankful for in Seattle. Fifteen Twenty One's opening ceremony took place yesterday morning. The event was held in the condo's porte-cochere and attended by Mayor Greg Nickels, William Justen, and Blaine Weber. As far as initial viewings are concerned, this one was more of a teaser event -- especially after waiting 20 minutes outside for all the speeches from local dignataries. When we were finally allowed inside, we were only able to view the lobby area. The lobby had a 10-foot locally crafted chandelier, a reclaimed timber art wall (see pictures above), 12 foot concierge desk, and large stone fireplace. No model home was available for viewing but I was told there will be one early next year. "The code encourages density through development of taller, and slender buildings. Under this updated zoning code, the developer may choose to build a taller, thinner building in exchange for contribution to the city's affordable housing fund. Through this project, Opus Northwest is providing $1.88 million [paid for by residents] to the city's affordable housing fund." 5 remaining pre-sale homes are still available with prices ranging from $975,000-$1,999,000. A few resale units are also on the market. (See available homes). The completed building is definitely one of the most striking condos in downtown and can be easily spotted if you driving along 99. It would be interesting to see how the homes turn out. Owners of vacation rental units in Elektra appealed the initial decision against the practice of renting out units for short stays last month. The hearing examiner ruled that the city could not enforce a 30-day minimal stay and VRUs owners won the appeal. This decision will probably upset some owners in the building who are concerned with alleged risks they believe are associated with temporary visitors. Read all the legalese on the hearing examiner's decisions here. (Update 03/02/09: I received an email from a resident, Tika Bordelon regarding the status of the appeal. "...THE DIRECTOR'S CONCLUSION THAT SHORT TERM RENTAL OF THE ELEKTRA CONDOMINIUM UNITS IS NOT A PERMITTED ACCESSORY USE..."
Elektra: Does your condo building come with VRUs? Auctioning of condos seem to be the latest trend for condos these days. Press condominiums is following the footsteps of Seventeen07 and auctioning 18 of their remaining homes on the market on December 13 at 1.00pm at the Grand Hyatt Hotel in downtown. Read more on Seattle PI. As we are heading towards the end of the year, the Seattle condo market will be slowing down as part of normal seasonality trends and amplified by jitters about the economy and housing markets. If you are considering purchasing a condo before the end of the year, some attractive incentives are to be had given the high inventory and sellers being more realistic about market conditions. There are a few condos that I think are worth checking out. One of them is the Parc in Belltown. The building was completed late last year and they have 24 homes remaining on the market. The developer is offering a couple of incentives. If you purchase a home, there will be a $15,000 buyer's bonus and an additional $1,000 referral bonus if you're a current Intra-corp homeowner. These homes are VA and FHA approved. The developer is also making some price adjustment on some of their homes so I think this condo building is worth checking out. Rent a condo or hotel? Four Seasons's open house took place on last Thursday. I was curious if the completed project would really live up to the Four Seasons brand and whopping price tags so I decided to check out their open house. I drove up to the entrance and was greeted by courteous hotel staff dressed in finely pressed Four Seasons attire ready to park the car, open the front doors, and provide you with the courtesy they would any hotel guest. Gallery Condos has started moving in home buyers. Approximately 50% of their inventory has sold with more than 30 homes closed so far. If you are thinking of touring this building, the sales center is located on the street level on the North end of the building. When it was initially launched, the sky lofts floor plans (2 level homes) were available from the 7th floor in the middle glass section of the building. However, due to higher demand for smaller floor plans, they changed to more single level open floor plans. The skylofts are available only on the ground level and penthouse levels. 4 penthouse level skylofts are sold. Only 10 sky lofts homes are available in the building. The developer also raised prices on some of the homes since their launch. No buyers' incentives are available. Gallery will have an opening event sometime early next year when all the units are completed. Compared to its close competitor, the Parc, Gallery is a good looking building with more amenities but offers less variety of floor plans. October numbers are in. They could be worse but they aren't very encouraging. 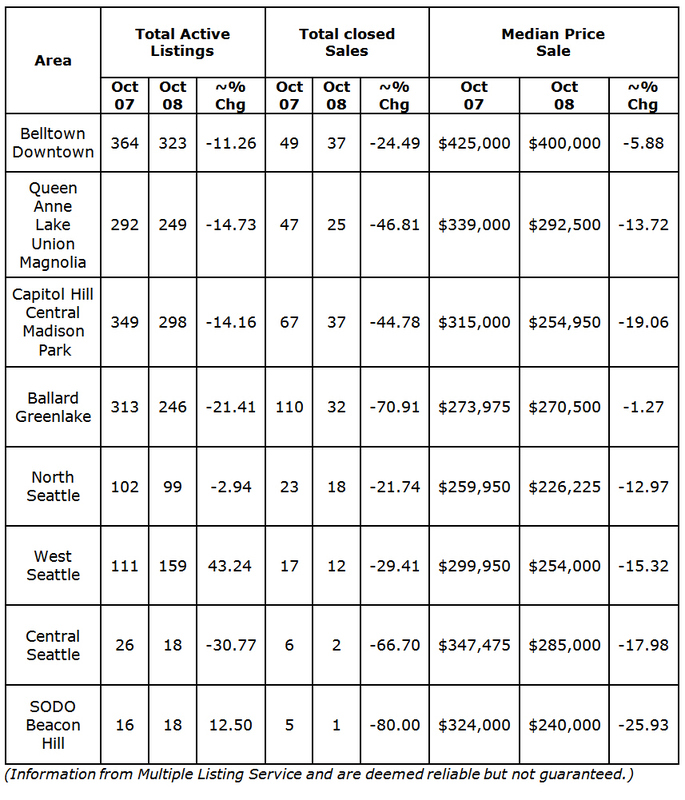 Seems like half of the buyers who might have been in the market decided to wait and see in October. Only the most confident buyers pulled the trigger while banks were collapsing and bailouts were being debated all around us. In fact, there were half as many pending sales in October 2008 as there were in October 2007. This was probably the most pronounced year-over-year decline since I started this blog a few years ago. Inventory on the market was also down versus last year (10% fewer listings year over year) and a little over 5% lower than September 2008. While this reduced inventory is the right direction if you want the market to find its bottom soon, it pails in magnitude relative to the pending sales decline. If November 2008 pending numbers come in higher, the same, or down <20% of November 2007 pending numbers, it will probably mean things are slow but that October might have been a particularly harsh month and not necessarily indicative of longer term trends. If November is just as bad as October was, we're in for a rough, rough winter. Now that the election is over and we have a new President(! ), there will be fewer political programs for me to watch and more time for blogging. Here are some thoughts on the recently completed Leona project. Last weekend, Leona had their open house and I popped by to check out their homes. 4 out of the 18 homes are sold. The historic apartment conversion has 2 penthouses added to the existing structure and 3 brand new multi-level condos constructed on the north side of the building on Ward St. There are quite a few different floor plans in the building, definitely not your traditional cookie cutter condos. The interior finishes will probably meet most buyers' expectations. Hardwood floors, slab countertops and Viking appliances come standard. The majority of the bedrooms come with a sizable walk-in closet. The large windows add light and height to the homes; however, they are using single pane windows. According to the sales center, the windows are hand blow glass. The developer wants to retain its original design and they claim it actually costs 3 times more to restore the windows than putting in new ones. As for the 3 multi-level condos, they are using double pane windows. They feel more like a house than a condo. I think in some ways, that will probably be a good fit for someone who is looking for more square footage but doesn't want to deal with maintenance or a yard but also wants something more unique than the typical row of town homes. Only one penthouse was available for viewing that day. It has a huge deck and an incredible view of the city. Overall, a nice project with a lot of promise. The big selling points are that it's a pretty unique building, has a nice location midway between Queen Anne and Seattle Center, and has a variety of attractive floor plans. The biggest concerns that occurred to me specific to this building are the wood frame construction and perhaps price tag (though I'm sure there's room for negotiation in light of the current market conditions). Veer Lofts, one of Vulcan's project in South Lake Union has recently completed construction. The condo is a few blocks away from Vulcan's other projects (Enso, Rollin and 2200 Westlake) on 9th Ave and Harrison in a slightly more industrial feeling part of South Lake Union. The 99 homes are comprised of full lofts, flexi lofts, and flat floor plans. Full lofts are on the ground floor and the top floor with 16 ' ceiling heights in the main level and 8' on the loft level. Flexi lofts are located on the 4th and 5th floors with approximately 12' ceiling heights in the main level and 4 1/2' ceilings in the flexi level (for sleeping). Flats are on the 2nd and 3rd floor with 9' ceilings. High $400,000's and above- 810-1,073 sqft.